Dispelling the Myths about Rescue Dogs and other Animals. If you are considering getting a new pet, adopting a rescue animal may be the right option for you. Rescue pets can include dogs, cats, small furries, farm pets and exotic animals so whatever you are looking for the perfect animal might be out there waiting for you! Here at Quantock, the staff own a lot of rescue animals! However, people are sometimes worried about taking on a rescue dog so we thought we would address some of the most common myths about rescue dog ownership. MYTH: The U.K. does not have a stray dog problem, so why bothering rescuing? Actually, there are ten of thousands of dogs in rescues and pounds throughout the U.K. and unfortunately many of these are put to sleep because they have nowhere to go. The R.S.P.C.A alone euthanised 3,400 dogs for non-medical reasons in 2011. MYTH: Only Staffies and mongrels end up in rescue. Unfortunately, due to irresponsible ownership and breeding, a high proportion of dogs in rescue are Staffies, who in the right hands make really wonderful pets and should not be overlooked. However, if you have a particular breed in mind, there are breed rescues associated with the vast majority of breeds, which can be found through contacting the Kennel Club or in some cases doing some research online. In fact, the vast majority of dogs looking for new homes come into rescue through no fault of their own. The most common reasons include relationship breakdown, moving into rented accommodation, emigration and in some cases the owner simply does not have enough time or money to care for it properly. If you adopt from a reputable rescue, these dogs should have full health checks and behavioural assessment prior to being put up for adoption. Here at Quantock we see plenty of very naughty dogs who have been part of their family since day one! It is true that the early socialisation stages of a puppy are very important, but in many cases rescue dogs have been part of a family home and have had this anyway. Dogs are very happy to “live in the moment” and although it may take some time, most rescue dog will soon settle in and love you as much as if they had always been with you. As said above, good rescues will assess a dog for suitability with children, cats, other dogs etc and it is important to match the correct dog to the correct home. Finally, meet Tessa (photo at the top), vet Dee’s rescue Golden Retriever, adopted from Irish Retriever Rescue three years ago. 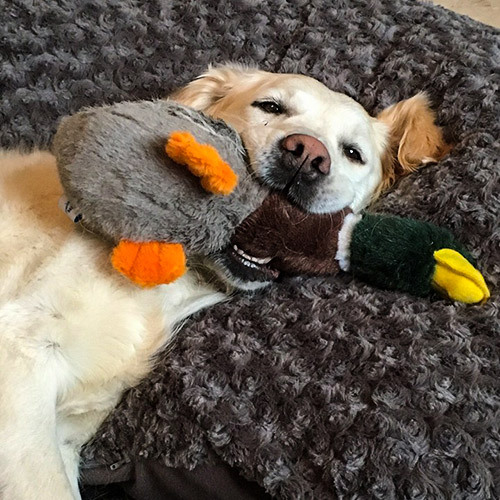 Tessa is a healthy, happy girl who loves dogs, cats and children and is the best behaved dog that Dee has ever owned- just one example of how wonderful rescue dogs can be!